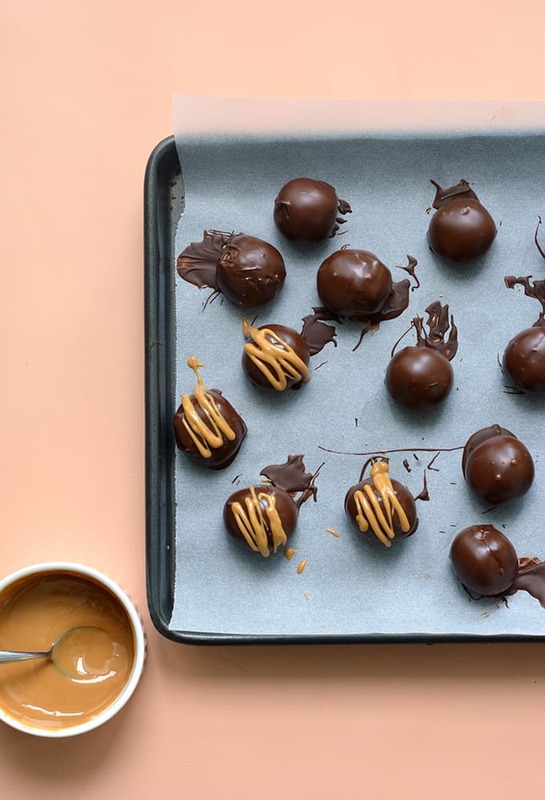 You only need 4 ingredient to make these delicious chocolate-dipped Peanut Butter Balls. A perfect no bake treat, these Peanut Butter Balls are a favourite for Christmas and Easter. They’re easy, quick, delicious and completely no bake. The best part? 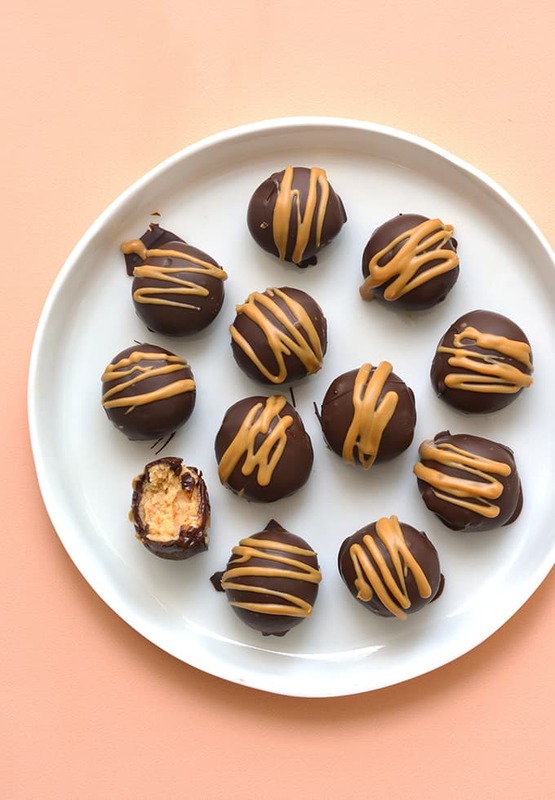 You only need four ingredients to make these Easy Peanut Butter Balls. I love a good Nutella Hazelnut Truffle or a good Caramel Truffle. 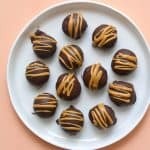 But these four ingredient Peanut Butter Balls have stolen my heart. They’re perfect for sharing. Whip these out at your next do and you’ll make new friends – guaranteed. They boast a soft, sweet peanut butter centre and a crisp shell of dark chocolate. 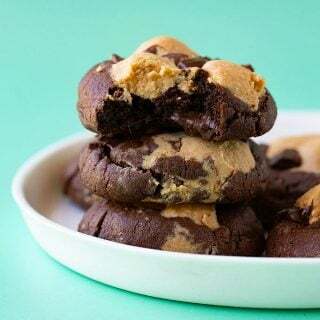 A drizzle of melted peanut butter makes them complete. Choose good quality chocolate for dipping. I actually don’t use ‘melting chocolate’ for truffle dipping. I’ve found that it sets up too quickly and has the tendency to seize – plus it doesn’t taste as good. I prefer to use a regular block of chocolate that’s broken up into pieces and melted. You can melt your chocolate either on the stove or in the microwave. Either way is fine. If these (or another) truffle seems too soft to dip, place them in the fridge to firm up. Sometimes I even put my truffles in the freezer before dipping. Dipping the truffles when they are cold helps them hold their shape if the chocolate is still warm and helps the chocolate to set. 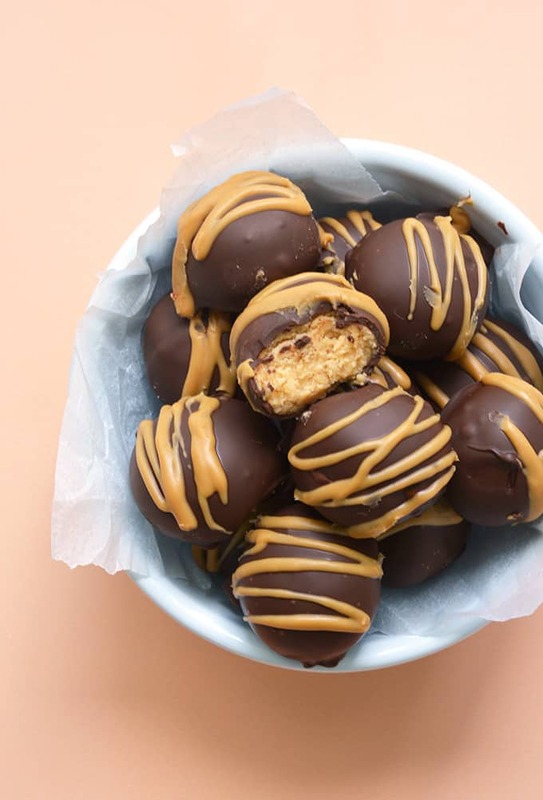 Delicious no bake Peanut Butter Balls dipped in dark chocolate. Line a large baking tray with baking or parchment paper. In a large mixing bowl, add butter and peanut butter. Mix briefly until smooth and creamy. Add icing sugar and mix until a soft dough forms. Scoop small tablespoons of peanut butter mixture and roll into a smooth ball using your hands. Place on prepared tray. Repeat util you have roughly 18 truffles. Place truffles in the fridge for at least 10 minutes. Break up chocolate into small pieces and place in a small microwave-safe bowl. Heat in the microwave, stirring every 20 seconds, until melted and smooth. 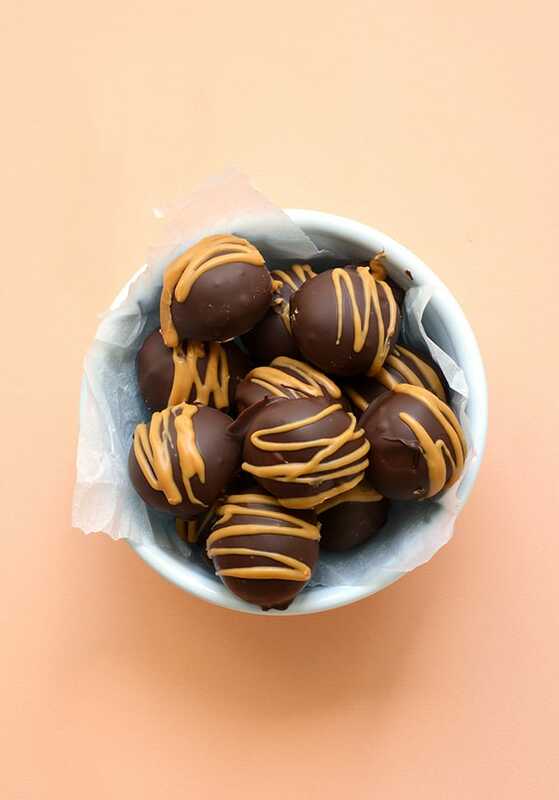 Dip each peanut butter ball into the chocolate, one at a time, and use a fork to get slowly lift them out. Gently shake off excess chocolate and place truffles on prepared tray. Pop in the fridge for 10-15 minutes to set. Add a few tablespoons of peanut butter to a small bowl and microwave 20 seconds or so, until melted and smooth. 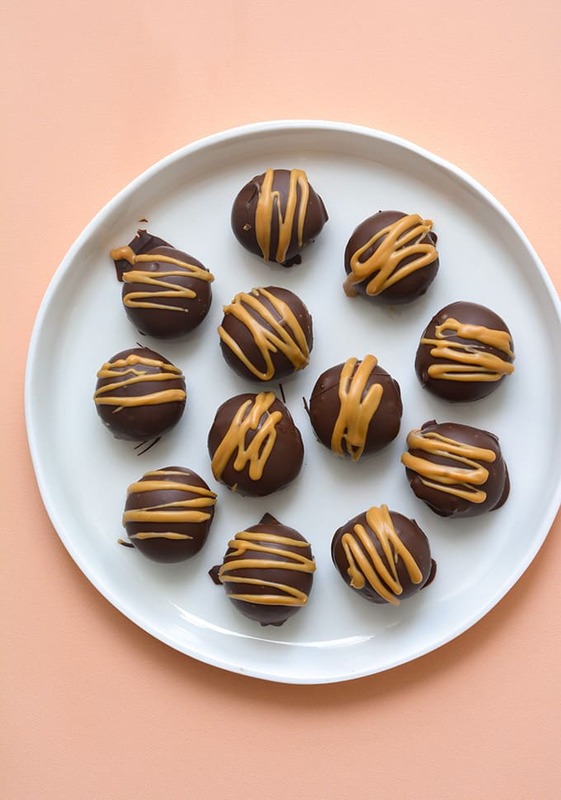 Drizzle peanut butter over truffles. 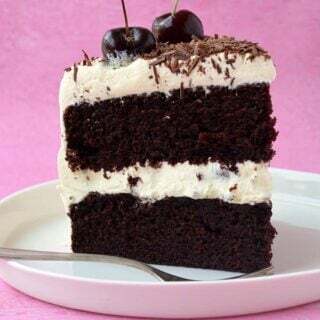 *I use a mix of both milk and dark chocolate. I recommend using a regular store-bought peanut butter for this recipe, rather than a ‘natural’ healthy peanut butter. If you find your peanut butter balls are too soft to roll, it may be because your butter was too soft. Simply leave the peanut butter mixture in the fridge for 30 more minutes – or even pop it in the freezer to firm up. I loved the peanut butter balls. Thank you so much Jessica Holms. Made lots of different kinds. Enjoyed all the different kinds. My favorite ones was when I drizzled the peanut butter on the top of them so delicious! Also enjoyed the rice Krispy cereal ones good crunch bar taste. Really nice of you to share that with us all Sarah. Then I made a few different ones myself, dipped into chocolate and added some coconut sprinkled on them. I used 1l2 cup smooth and also added 1/4 cup crunchy peanut butter. I cut the powdered sugar back to 1 cup and added some rice crispys cereal. These had a wonderful creamy yet crunchy airy texture.. super easy and delicious! I used salted butted not paying attention mixture to soft to roll or do I start over using unsalted butter or put in fridge to form up ??! Wet your fingers eith water. These look awesome. Do you know how long these will last please? And do they need to be kept in the fridge? Hi Jasmine! These keep well for up to 5 days and yes I recommend storing in the fridge. Hope you enjoy them! These look like the ultimate snack! 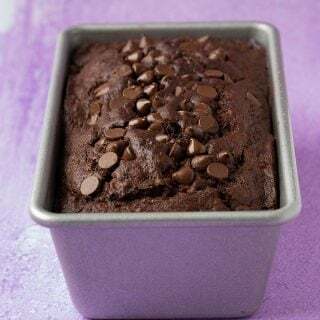 I love chocolate and peanut butter together – simply delicious! These were so delicious! And super easy to make.